Welcome to the LitCharts study guide on Elizabeth Kolbert's The Sixth Extinction. Created by the original team behind SparkNotes, LitCharts are the world's best literature guides. A concise biography of Elizabeth Kolbert plus historical and literary context for The Sixth Extinction. A quick-reference summary: The Sixth Extinction on a single page. In-depth summary and analysis of every Chapter of The Sixth Extinction. Visual theme-tracking, too. Explanations, analysis, and visualizations of The Sixth Extinction's themes. The Sixth Extinction's important quotes, sortable by theme, character, or Chapter. Description, analysis, and timelines for The Sixth Extinction's characters. Description, analysis, and timelines for The Sixth Extinction's terms. Explanations of The Sixth Extinction's symbols, and tracking of where they appear. An interactive data visualization of The Sixth Extinction's plot and themes. Elizabeth Kolbert grew up in the Bronx, and studied English at Yale University. She won a prestigious Fulbright Scholarship, and studied at the University of Hamburg, in Germany. While in Germany, she began working for the New York Times, and eventually became a columnist for the newspaper. In 1999, Kolbert became a staff writer for the New Yorker, where she has written many popular articles about science and technology. Kolbert’s most successful book, both critically and financially, was The Sixth Extinction, which won the Pulitzer Prize for General Nonfiction in 2014. Kolbert alludes to many important historical events, but two of the most important are the “Out of Africa” diaspora that took place about 115,000 years ago. According to this theory, humans migrated out of Africa and eventually colonized Eurasia, Australia, and the Americas, paving the way for many mass extinctions. Another key historical event was the publication of The Origin of Species in 1859, which sparked a scientific revolution and paved the way for research into the topic of extinction. While The Sixth Extinction doesn’t allude to many works of literature, it has been compared to the 1962 environmental science classic Silent Spring by Rachel Carson. Carson criticizes the use of pesticides in farming, and goes on to make broader points about the role of humanity in destroying the environment. While Carson is critical of the pesticide industry, she adopts a more nuanced tone when speaking of the human race’s environmental activities, similar to the way Kolbert ultimately makes a nuanced point about how humans can preserve the world’s biodiversity. Another important book for Kolbert is Charles Darwin’s On the Origin of Species (1859), the first popular explanation of the modern theory of natural selection. In his book, Darwin described life as a constant competition between life forms for a finite number of resources. In her own book, Kolbert sometimes uses the Darwinian paradigm to analyze why certain animals die out over time. Awards awards awards. Kolbert has won more than her fair share of big awards for writing and journalism: in addition to her Pulitzer Prize for The Sixth Extinction, she’s won two National Magazine awards, the Heinz Award, and a Guggenheim Fellowship. Arn, Jackson. "The Sixth Extinction." LitCharts. LitCharts LLC, 22 Jun 2017. Web. 21 Apr 2019. Arn, Jackson. "The Sixth Extinction." LitCharts LLC, June 22, 2017. 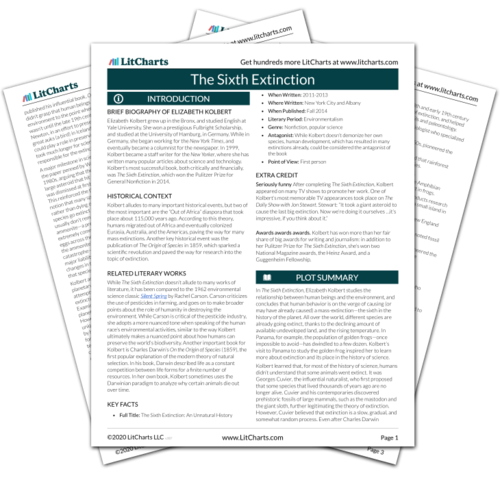 Retrieved April 21, 2019. https://www.litcharts.com/lit/the-sixth-extinction.